Sweet potatoes are one of the oldest vegetables known to man and have been consumed since prehistoric times. There are about 400 varieties of sweet potatoes and depending on their variety, sweet potatoes can have flesh that is white, yellow, orange, red or even purple. Some sweet potatoes are firm, dry, and mealy, while others are soft and moist. In both types, the taste is starchy and sweet with different varieties having different unique tastes. 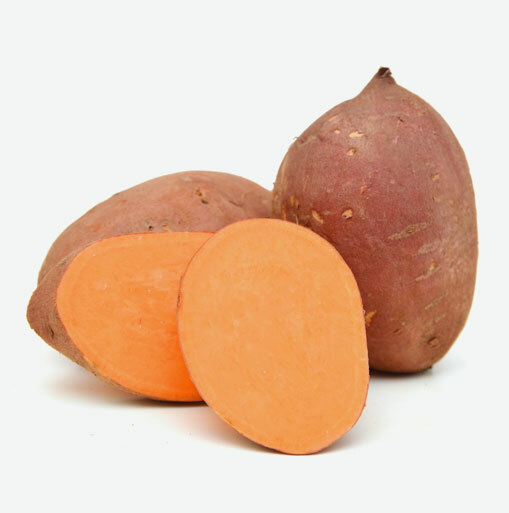 The moist-fleshed, orange-coloured root vegetable that is often thought of as a “yam” is actually a sweet potato. Although sweet potatoes may be part of the Christmas tradition, be sure to add these wonderful naturally sweet vegetables to your meals throughout the year as they are some of the most nutritious vegetables around. Sweet potatoes are now considered an “anti-diabetic” food because of some recent animal studies in which these vegetables helped to stabilize blood sugar levels and lowered insulin resistance. Sweet potatoes are lower on the glycemic index than russet potatoes and are an excellent source of vitamin A, vitamin C and manganese. They are also a good source of copper, dietary fiber, vitamin B6, potassium and iron. Vitamin A and Vitamin C are powerful antioxidants that help to eliminate free radicals that damage cells and are associated with the development of conditions like arteriosclerosis, diabetes, heart disease, and colon cancer. These nutrients are also anti-inflammatory and can be helpful in reducing the severity of conditions where inflammation plays a role, such as asthma, osteoarthritis, and rheumatoid arthritis. Choose sweet potatoes that are firm and do not have any cracks, bruises or soft spots. Avoid those that are displayed in the refrigerated section of the produce department since cold temperature negatively alters their taste. Sweet potatoes should be stored in a cool, dark and well-ventilated place, where they will keep fresh for up to ten days. Keep them away from exposure to sunlight or temperatures above 60°F since this will cause them to sprout or ferment. Purée cooked sweet potatoes with bananas, maple syrup and cinnamon. Top with chopped walnuts and you have a great dessert. Steam cubed sweet potatoes, tofu, and broccoli. Mix in raisins and serve hot or cold with a curried vinaigrette dressing. Try making sweet potato pie, bread, muffins or pudding.